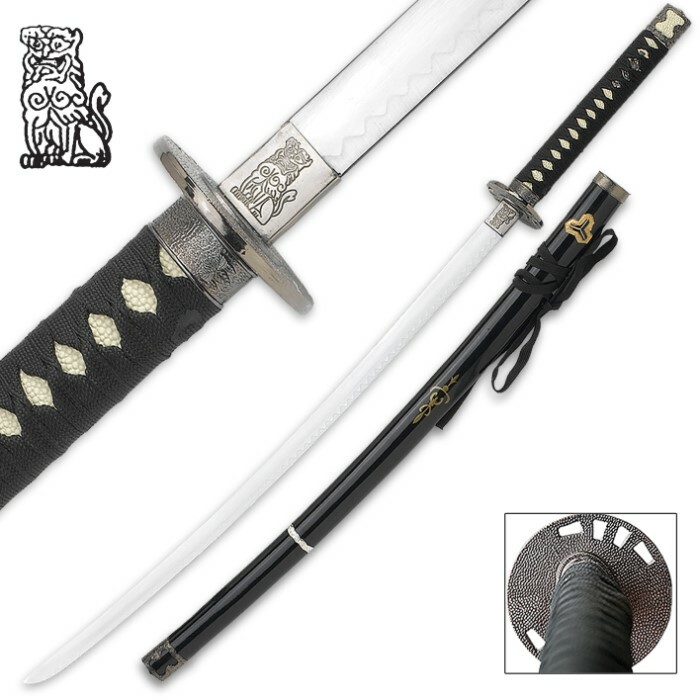 Imperial Japanese Samurai Warrior Katana Sword - 37"
This historically inspired Imperial Japanese Samurai Warrior katana sword truly is an inspired work of art, overflowing with authenticity and attention to detail. The 26-1/2"" stainless steel blade is hefty with a high-polish finish. The high-polish finish of the blade is beautifully contrasted with antique-finished hardware including a cast metal habaki, tsuba, menuki and pommel. Like traditional katana swords from centuries past, an imitation ray skin handle with heavy cord wrappings completes the design. The decorative wooden scabbard features a lacquered finish with decorative embellishments to coordinate with the sword. Measures 37-7/8"" overall. This is one of the most beautiful display swords I have. The blade is straight, semi sharp, and longer than any other display sword I have. The handle is well made. Nothing loose. No rattle. The scabbard or saya is beautiful as well. Sword fits in it perfectly. The guard or tsuba resembles that of the bride's sword in Kill Bill. I love this sword! Thanks BudK. This sword is of a very poor make. I craft many of my own blades, yet wanted something better than what I could do myself. The tang was off-set and the blade itself was of a poor quality steel. As a martial artist of Kajukenbo, my weapon has to be of a good make, seeing as we believe that a weapon is an extension of ourselves. This is a sword that I wouldn't give as a gift. For the price, this can't be beat. It's much heavier (not heavy but heavier than I expected) than it should be for the money. Comes with an edge which surprised me! Obviously you don't want to try and cut anything with this but it looks good hanging on my wall. Really nice, almost sharp, looks great, well worth the money, I am happy with it.